Koetter Woodworking, Inc. guarantees each of our hand-assembled, furniture quality doors to be of good material and workmanship and to be free from manufacturing defects at the time of shipment that would render them unfit for the purpose for which they are intended. Detailed warranty information is available below. In the event a defect is discovered by inspection of a door upon receipt of shipment from Koetter Woodworking Inc., notice must be given within 10 days thereafter and before the door has any additional work performed on it and/or the door is installed. No labor, installation, refinishing, or removal expenses are covered by this warranty. Koetter Woodworking is not responsible for any additional transportation costs other than pickup and delivery on our trucks at normally scheduled customer locations. Natural variations in color, texture or general surface appearance of raw wood are not considered defects. The “appearance” of field finished doors is not covered by this warranty in any event including, but not limited to gloss level, texture, or color. Placement, quantity or the size of knots in doors that are manufactured from any “knotty” species are not covered under the terms of warranty. Any deterioration or failure contributed to by the failure to protect and seal ALL surfaces including the top and bottom of the door and the hardware/hinge cutouts, either prior to or immediately after hanging, are not covered by this warranty. Any condition or problem caused by failure to follow the recommended storage, handling, application, finishing and installation instructions as outlined are not covered by this warranty. Koetter Woodworking reserves the right to perform a field inspection, to be made by one of our representatives prior to adjustment, repair, or replacement. If Koetter Woodworking deems that a field visit is necessary, we are committed to have a representative available within 10-days of notification from the customer. Koetter Woodworking, Inc. shall not be liable for consequential, indirect, incidental damages, nor for any amount in excess of the manufacturer’s selling price for the door or door unit involved. Damage caused by attempts to repair doors by anyone other than Koetter Woodworking will not be warranted. No compensation will be paid to any outside contractor for performing any work in respect of a warranty claim without prior written consent and authoritation from Koetter Woodworking, Inc.
Damage resulting from any cause beyond the control of Koetter Woodworking, Inc., including, but not limited to: exposure to excessive heat, dryness, humidity, moisture, or direct sunlight; or damage caused by misuse, abuse, neglect, accident, normal wear and tear, sprinkler systems, mishandling, fire, flood, earthquake, storm, tornado, or any other act of nature are not covered under the terms of this warranty. Fire rated doors are covered under the same terms and conditions as outlined in this warranty. Warranty does not apply to doors shipped outside the continental United States, Hawaii or Canada. Because wood can respond in different ways to the variety of atmospheric and environmental conditions, it is imperative that special attention is given to the door and the necessary care and effort taken to protect the door in the unfinished state to minimize the potential for problems. Doors shall always be stored flat or in a vertical position (not leaned against a wall), in a clean, dry environment. Protect from dirt, moisture & abuse. Shrink wrap should always be left on doors until they are ready for finishing. All glass on interior lited doors comes with a factory-applied protective film which should be left on the doors until the final cleanup stages (after they are completely finished). This film provides added protection during transportation as well as damage that can occur from construction debris. Doors should be lifted and carried, not dragged across one another. HVAC must be operational and maintaining a relative humidity of 35% – 45% at a temperature of 65 – 75 degrees. Doors shall not be exposed to excessive heat, dryness, humidity, moisture, or direct sunlight. Handle door with clean gloves and do not drag doors across each other or other surfaces. Deliver doors to the jobsite after plaster, concrete, or sheetrock mud is dry. Do not store doors in wet basements, areas with uncured concrete, areas with wet drywall mud, or any other open environment that is not humidity controlled. Since these doors are shipped to you unsealed and unfinished, we cannot warrant against the natural characteristics of the wood which may occur in the various conditions encountered from our plant to your finished opening. (Factory or field applied primer does not constitute as a sealer or finish). Doors on the jobsite must have all edges completely sealed (including the top and bottom) with a premium finish or paint with at least a 15 year warranty, appropriate for the type of use of the door (such as interior or exterior.) Finish must be applied within one week of delivery. A stain or primer coat alone does not constitute an acceptable sealer. Doors must have equal seal coat on all 6- sides. Prior to finishing, the finisher must re-sand the entire surface of the door with 150-grit or finer sandpaper to remove all handling marks, scratches, raised grain and effects of exposure to moisture. Apply sealer, primer, or first coat of required finish immediately after fitting, cutting for hardware. Once you begin the process of finishing a door, it is crucial that you completely finish it without starting and stopping for extended periods of time. All exposed surfaces of the door must be sealed, including the top, bottom, side edges, and the hardware cutouts. Certain species of wood contain chemicals that react unfavorably with certain finishes, causing dark stain spots. Notify your finish supplier immediately if any undesirable reaction is noticed. When working with Poplar, the use of a medium to dark stain is recommended. Whenever possible, the species/finish combination should be tested prior to finishing the doors. For best results, spray finishing is recommended. Variations or unsatisfactory results in gloss levels, texture or appearance resulting from the field application of paint or other finishing material is not warranted. Always consult with your finish supplier for suggested finishing techniques on various species. The above finishing instructions are provided only as a general guideline. It is the responsibility of the finisher to carefully follow the instructions as specified by the finish manufacturer. All doors 7’4” and under must have at least 3 hinges and doors over 7’4” must have at least 4 hinges or all warranties concerning warp or twist are void. Misalignment in the frame or jamb in which the door is hung, or improper hanging methods performed by anyone other than Koetter Woodworking, is not within the control of Koetter Woodworking, Inc., and is therefore not warranted. Clearances between door edges and door frames must be a minimum of 1/16” on the hinge edge and 1/8” on the latch edge and head. All hardware locations, preparations for hardware, and methods of hardware attachment must be appropriate for the specific door construction. Templates for specific hardware preparation are available from the hardware manufacturer. Warp exceeding one-quarter inch (1/4”) in the plane of the door on all doors up to 8’0” in height is warranted. Doors over 8’0” in height, up to 10’0” must be manufactured at 2 ¼” in thickness or all warranties pertaining to warp, twist and expansion will be void. Doors over 8’0” in height up to 10’0” (which are manufactured at 2 1/4″ thickness) are warranted against warp which exceeds one-half inch (1/2“). Note: One-panel or full view glass doors over 8’0” up to 10’0” in height are not covered under the terms of this warranty for warp, twist, or expansion. Doors used as pocket doors will only be considered out of specification in terms of warp if the warp is more than one-fourth inch (1/4”). Doors warped less than the limits outlined above do not exceed normal material expectation and are not considered out of warranty. Expansion and contraction which may occur due to changing environmental conditions (which can occur seasonally) is not warranted. This is particularly common with panels since they are designed to float. If a door warps it may be necessary to leave the door installed for up to one (1) year to ensure proper moisture equalization before the door is deemed out of specification. This waiting period if required will not affect the warranty term. Doors over 3’6” wide up to 4’0” wide may be prone to increased twist and warp, therefore they are only warranted at 1-1/2 times the normal warp tolerance. These doors may also be prone to unusual stress which will increase the risk of splitting and warping, and therefore, will only be warranted for 6-months. In an effort to better serve our customers, Koetter Woodworking Inc. has warranty claims policy and procedures to track all warranty claims. Ask that the door be returned and Koetter Woodworking will refund the purchase price to the original buyer. All warranty returns must have authorization before the product(s) are shipped back. Any return must be given prior authorization by your sales representative before returning items for claim or credit. All returns should be accompanied by a copy of the original invoice in which the product was purchased along with a completed Return of Goods Authorization. This will ensure that the return can be speedily identified, traced as to customer and circumstance, and processed efficiently. It is understood that many warrantable circumstances do not develop and fully become apparent until well after the product is installed, but some defects or flaws may be detected as soon as the door or side lite is unpackaged. Since many minor flaws can be repaired or corrected, all items should be inspected thoroughly for such defects upon receipt and before machining. Please be aware that the machining of a door or side lite constitutes acceptance of the product as it was received by our customer. Any minor flaws or defects that may exist at the time of machining will not be considered as defective product or claimable once additional labor has begun. Inspect all items thoroughly before the machining process takes place. Please be aware that any credit due for defective product is not processed and issued until the defective item has been returned. Any required replacement product is invoiced at the original unit price as it is shipped. Koetter Woodworking will not be responsible for any amount in excess of the original purchase price of the defective product. All items returned must be packaged properly in order to ensure that credit due is processed efficiently, and to protect against any further unnecessary damage to the product. Proper packaging includes an adequate pallet, proper top, bottom and edge protective covering. Items not given adequate packaging protection during return shipment may void the warranty. 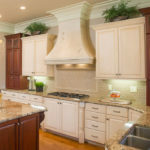 Koetter Woodworking, Inc. offers a warranty that covers defective conditions based on industry standards of acceptability. We take a fair and objective view of any warranty situation that may arise, but it is important to understand that a warranty does not cover any and all problems that may occur. We urge you to call if you have questions or need further clarification on our warranty conditions or relating to any specific situation that you may encounter. Koetter Woodworking’s Exterior Door Warranty is only applicable to doors manufactured in one of the following species: Alder, Knotty Alder, Cherry, Fir, KW Mahogany, Pine, Knotty Pine, Walnut and White Oak. Any deterioration or failure contributed to by the failure to protect and seal ALL surfaces including the top and bottom of the door and the hardware/hinge cutouts, either prior to or immediately after hanging, are not covered under terms of warranty. Exterior doors must be manufactured at a minimum thickness of 1 ¾”. No compensation will be paid to any outside contractor for performing any work in respect of a warranty claim without prior written consent and authorization from Koetter Woodworking, Inc.
All exposed surfaces of the door must be sealed, including the top, bottom, side edges, and the hardware cutouts. Variations or unsatisfactory results in gloss levels, texture or appearance resulting from the field application of paint or other finishing material is not warranted. Open voids on “knotty” species must be filled and/or sealed with a product conducive to your finish application as recommended by the finish manufacturer. 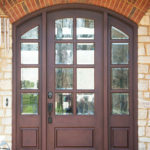 Use only oil-based stains, sealers, or primers on exterior doors. At least three (3) coats of exterior grade varnish with a UV Inhibitor must be applied to all exterior doors. A marine grade finish is the best and will best protect your investment on exterior doors. In order not to induce warp or excessive deterioration of your door, avoid using dark stains or paints on the door surfaces exposed to direct sunlight. Doors painted Black (or any Dark Color) with exposure to sunlight will not be warranted. Most finishes, particularly on exterior doors deteriorate relatively quickly. To ensure exterior doors receive the protection required, inspect the condition of exterior finish at least once a year. Refinish as soon as finish deterioration is visible to maintain the protective stability of the finish. Be sure that you refinish all six sides. Any exterior door which is taller than 8’0” must include a multi-point hardware system or all warranties concerning warp and twist are void. All exterior doors should have an overhang adequate to protect the surface of the door from direct weather conditions. The minimum recommended overhang distance from the exterior wall where the door is installed is equal to the distance from the bottom of the door to the highest point under the overhang. The width should extend half of this distance from each edge of the door unit. Due to the excessive heat build-up, any exterior door used with an un-vented glass storm door will not be warranted. If a door warps it may be necessary to leave the door installed for up to one (1) year to ensure proper moisture equalization before the door is deemed out of specification. This waiting period, if required, will not affect the warranty term. Koetter Woodworking, Inc. warrants our insulated glass for a period of five (5) years from the date of manufacture, against permanent failure of the hermetic seal, directly attributed to defective manufacturing. This warranty does not apply if the failure of the seal is caused by an Act of God, damage as a result of exposure to corrosive fumes or condensates, damage resulting from excessive stress from movement of the structure, glass distortion or breakage, mishandling or improper installation or by any other cause not within our exclusive control. Under the terms of this warranty, our obligation is to replace the defective glass, F.O.B. dealer’s warehouse from which the original sale was made. No labor, installation and/or consequential damages are included. For a period of five (5) years after manufacturing, a replacement insulated glass panel shall be furnished, for excessive fogging problems only. Koetter Woodworking, Inc may, at its option, request door be returned and refund the price we sold the defective door for in lieu of furnishing a replacement.